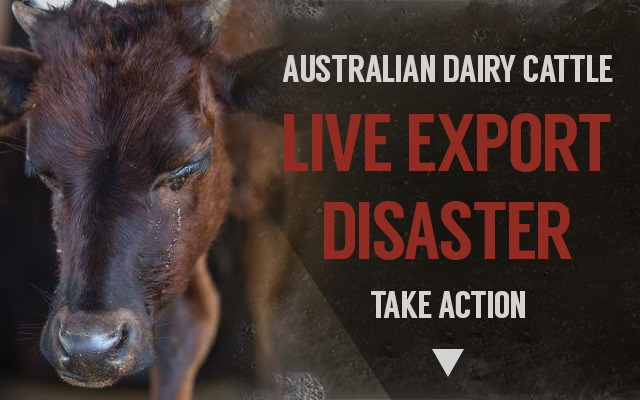 BREAKING NEWS - The ABC has revealed horrifying images and footage of sick, dying and dead dairy cattle and calves, that had been live exported to Sri Lanka for use in breeding and production. CLICK HERE to see the full story. Warning – this story contains distressing imagery and footage. CLICK HERE to read our media statement. Each year Australia sends tens of thousands of dairy cattle and breeding animals all over the world to places like China, Indonesia, Taiwan and Malaysia to help them make dairy products and improve their local herds through breeding programs. But unfortunately for these animals there are no laws to protect them from cruelty once they leave Australia, and nothing that guarantees their destination has the capacity to care for them – they are the forgotten animals. While Australia’s live export regulation has been repeatedly proven to be inadequate, animals live exported for breeding or production have no protections at all. They are the #forgottenanimals, and it’s not good enough. Join us in demanding that the Australian government acts now to protect these animals from cruelty. Don’t let these animals be forgotten. The Australian Government must act now to review the Exporter Supply Chain Assurance System (ESCAS), and ensure it is expanded to protect animals live exported for production and breeding overseas, as well those designated for slaughter. The Australian Government must act immediately to close this glaring loophole in the export of animals from Australia. I was appalled to learn there are no government regulations to protect the tens of thousands of Australian dairy and breeding animals that are exported each year, once they arrive overseas. I understand that the trade in breeding animals is one way that Australian producers can assist other countries expand their own breeding and dairy herds. However, I think it’s vital that Australian animals should only be exported to facilities where there is evidence that they will be treated humanely. We have a duty of care to the animals that are born in Australia, sending them overseas to destinations where they have no capacity to care for them is a violation of this duty. The Australian community demands the live export industry act immediately to protect the welfare of these animals. I ask that you immediately commit to reviewing the Exporter Supply Chain Assurance System to ensure its efficacy in protecting Australian animals, and expand it to apply to animals exported for dairy and breeding.